Featuring music of Harvey Sollberger, with flutist Leonard Garrison and the IWO Flute Quartet. Featuring music of Mozart, Chopin, John Psathas, Gareth Farr, and Joaquin Rodrigo. New recordings released in 2015! Released on September 11, 2015 through Highwater Classics. Featuring the Kerner Lieder, Op.35 by Robert Schumann as well as A Shropshire Lad and Bredon Hill by George Butterworth. Released on September 1, 2015 through Albany Records. Featuring music by French composers such as Georges Brun, Claude Arrieu, Louis Aubert, Henri Busser, Arthur Honegger, and others. 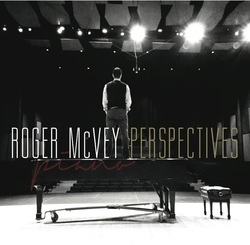 Roger McVey's third CD recording, Perspectives, was released in 2012. It features music by Bach, Rachmaninoff, and Liszt, as well as contemporary composers Marc Mellits, Wynn-Anne Rossi, J. Michael Roy, and Nikolai Kapustin.